-Green cabbage leave flavoured with ginger, chilli pepper and anis. 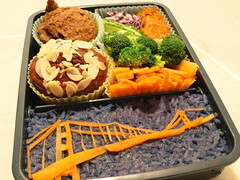 This my yesterday bento with the blue naturally coloured rice. Conclusion it is really tasty and it has been approved by Bear. I tried to present a little baby boy wrapped in a cabbage leaf. A French joke, I believe. It came to my mind that you might be interested to have a overview of different natural colouring I have blogged. 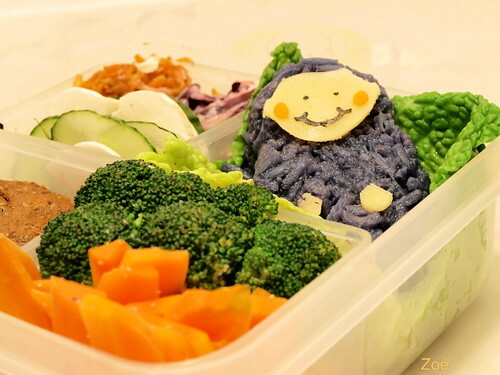 (the link on the colour refers to the post I featured this rice colouring, the link on the vegetables refers to the recipe). Red: Cherry, Beetroot , Tomato(updated). Bright yellow, light orange: saffron. Blue: Red cabbage with raising powder. I mostly used them here to dye rice, but you can dye eggs, cakes, icing sugar. Dying eggs can also be done using tea or onions.